Operation on this conveyor system was humming along when suddenly the chain climbed the sprocket on this Hanson gear box. 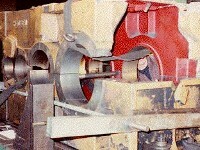 The shaft tore loose and proceeded to selfdestruct. Plant operation was brought to a dead stop at a cost of $300,000 per day. Hanson gear box is in nine pieces upon arrival to shop. Precise alignment and clamping in a variety of places re-established critical dimensions. 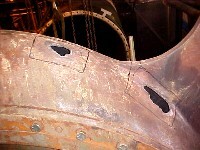 For the completed repair, no machining was necessary. Procedure saved owner considerable downtime as a new gear box would not be available for nine months.